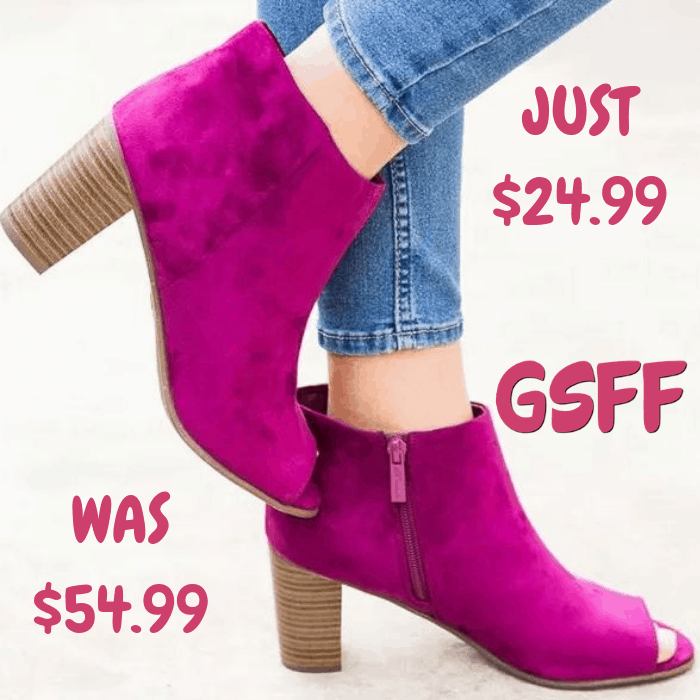 Peep Toe Booties Just $24.99! Down From $55! FREE Shipping! You are here: Home / Great Deals / Peep Toe Booties Just $24.99! Down From $55! FREE Shipping! For a limited time only! Right now at Jane, you can score these Peep Toe Booties for just $24.99 down from $54.99 PLUS FREE shipping! Fall into these absolutely gorgeous booties that were made for fall fashion! They are crafted with faux suede, features a cute peep toe, side zipper, cushioned insole and a 3” chunky heel. This style is available in multiple colors! Wear this pair with a cute sweater dress and tights for the ultimate fall look.